The Rename Child Sheet dialog. This dialog allows the designer to configure options for renaming the child schematic sheet referenced by the sheet symbol currently uner the cursor. From the Schematic Editor, right-click over the required placed sheet symbol, and choose the Sheet Symbol Actions » Rename Child Sheet command from the context menu. New child sheet file name - this field initially reflects the current name for the document. Type the new name for the document as required, ensuring that the .SchDoc extension remains. 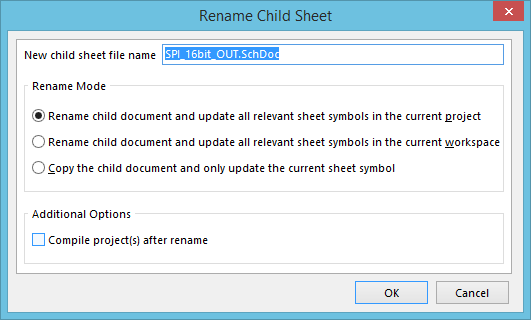 Rename child document and update all relevant sheet symbols in the current project - enable this option to rename the child sheet, and update all sheet symbols on source schematics in the active project that point to this sheet. The Filename field for each sheet symbol will be updated to reflect the newly named child sheet. Rename child document and update all relevant sheet symbols in the current workspace - enable this option to rename the child sheet, and update all sheet symbols on source schematics across all open projects, that point to this sheet. The Filename field for each sheet symbol will be updated to reflect the newly named child sheet. Copy the child document and only update the current sheet symbol - enable this option to take a copy of the child sheet before renaming the original. Only the current sheet symbol (under the cursor) is updated using this option. This is useful when the current child sheet is referenced by multiple sheet symbols, and one sheet symbol needs to reference a modified version of the circuitry contained on that sheet. You still want to keep the original sheet, you are simply creating a renamed copy of this sheet with which to point to from a single sheet symbol. You can then modify the content of the sheet as required. Compile project(s) after rename - enable this option to ensure that the newly named child sheet is correctly inserted into the design hierarchy of each affected project, which will be reflected on the Projects panel.